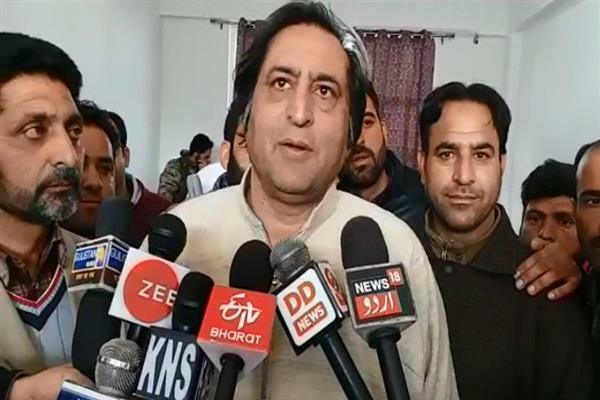 Srinagar: Peoples Conference (PC) chairman and former minister, Sajad Gani Lone on Thursday said that National Conference (NC) always betrayed people of Jammu and Kashmir. Reacting to the statements being made by NC leaders, Lone while talking to reporters at Lolab today said that it was NC that betrayed people of the State from time to time. He added that in 1996 when former Prime Minister P.V. Narasimha Rao had stated that sky is the limit that it was being presumed that people of Jammu and Kashmir will be offered autonomy. “At that time, it was being presumed that people will be asked to fight elections then pass the bill on autonomy in assembly and they will have no objection, nobody was willing to fight the elections but Dr. Farooq Abdullah came forward and asked to give him power and he will fight the elections,” he said. Lone also added that they are making emotional statements over human right abuse but let they openly say that how many persons were killed during their rule. “Why don’t they (NC) leaders speak over the killings that occurred during their tenure? Does Omar have any details how many were killed during his rule,” he asked.